Is Kairosoft's latest game the emperor's new clothes or a perfect fit? If there's any danger that Kairosoft is about to exhaust its supply of inspiration for cute and light management sims, then you'd never guess so from Pocket Clothier. Shopping malls, planetary bases, schools, football leagues and the more quiet pursuit of the ultimate humble hot spring have all been drawn upon in previous years but this is new, if comfortable, ground. Pocket Clothier is not, as you might expect from the title, some sort of horrific sweat-shop simulator with a political message, rather it focuses on the humble retail store and the terrible importance of color-coordinating shop displays and leaving the shelves nice and tidy after browsing, if you don't mind thanks. Right from the first glance you know this could only be a Kairosoft game. 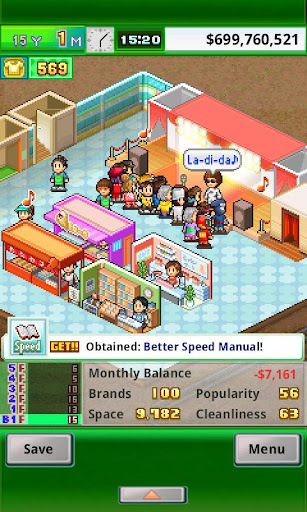 As with all Kairosoft titles, you start off small with the eventual aim of growing your shop larger and larger, filling it with more and more luxurious items until you've built the very pinnacle of retail therapy. Of course there's plenty of strategy to be considered, and you'll need to balance your monthly profits with maintaining an appealing and well-stocked shop-front, while also considering those all-important national retail awards as you chase to become the ultimate retail hotspot. As with the new console launches that featured in Game Dev Story, the fashion world will occasionally light up with an obsession for the latest gaudy finery, and you'll need to work furiously to anticipate the demand and keep your shelves stocked for the hordes of hungry fashion victims. Careful color coordination will make your stock look more appealing and, of course, you'll need to keep your staff on their toes and upgrade your shop to keep it looking fabulous. The music is ever-so Kairosoft which also means it's ever-so slightly annoying, and there's no nice way of saying that the short looping harmonica noodling becomes a little bit grating after a while. You'll also need to be willing to throw yourself into the deep end somewhat, as Pocket Clothier's tutorials are a little thin, and you'll learn largely through mistakes and missed opportunities. In many ways this is just another Kairosoft title, and it's becoming increasingly hard to differentiate one title from another beyond the superficial gloss that's laid over the same old mechanics time and time again. But for all that, we've had a lot more fun with Pocket Clothier than we've had with their other output for some time, and so it gets a very hearty seal of approval from us. If you've loved the developer's other output, you know exactly what you're getting here. 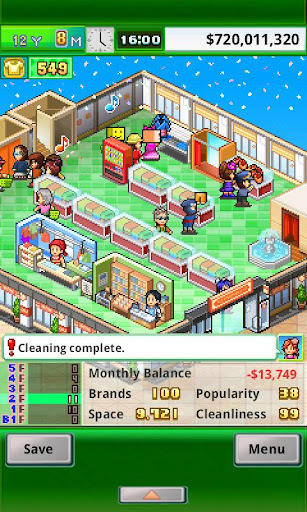 What's Hot: Kairosoft at its best, with a return to form that offers a surprising amount of depth. What's Not: The music will grate rather quickly. There can only be so much mileage left in the underlying gameplay.